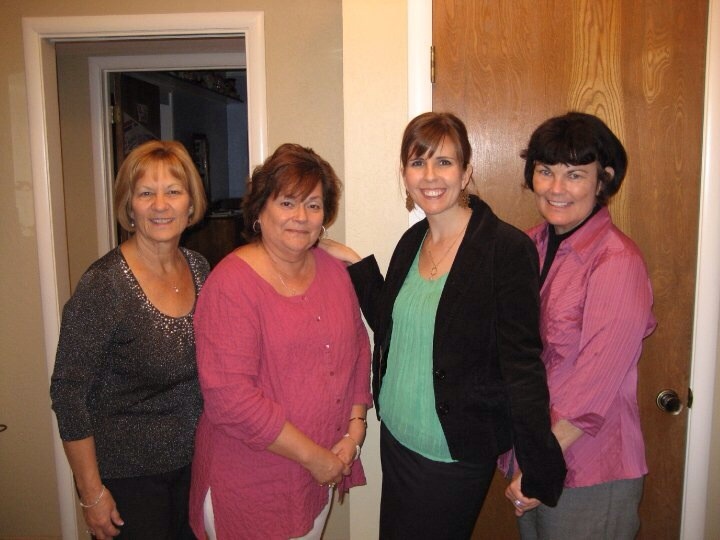 Gail Jones (second from left) was one of several longtime family friends who threw me a bridal shower. It is important to write. For so many reasons, it is important to write. Writing helps to document, for now, for the future. Helps to preserve a moment of feeling, information about a topic, stories to share with others. Helps to process difficult things, helps to remember wonderful things, helps to create a record of life. Gail (Fernandez) Jones thought so, at least when it comes to one’s family history. She was interviewed on the subject here. I just learned this, three-and-a-half years later, and one week after her death. I am reminded of the importance of writing now, as I try to accept the passing of this longtime family friend, dance teacher, elementary school teacher, arts aficionado, mother, grandmother, wife, appreciator of fine food and wine, high school “songster,” book club champion, documenter of family history… she was so many things to so many people. So I will try to write now, disjointed and stream of consciousness and imperfect as it may be, to document this moment in life, and the end of an important one. She was “Miss Jones” to countless kids in the Sacramento area dance world (me included, until I was an adult). Mrs. Jones to elementary school students. Mom to Wendy and Bonnie. Gail to husband Rick – and to hundreds of friends. Grandma to Joshua. I think of all of these roles, all of these relationships, all of these people who are mourning her loss, as I attempt to write about her now. My own mother met Gail during “mommy and me” swim classes when I was just months old. Wendy, her eldest daughter, and I are now nearing 40. Our families – the Smiths and the Joneses, no joke – have known each other a lifetime. Now, officially, much of Gail’s lifetime. The kids of each family grew up together, a few blocks away from each other. Each with two daughters around the same age, it was a perfect match in family friendships. We spent holidays together. We “camped” at their cabin together, playing Uno and War late into the night. We took dance classes, art classes, and did local musical theater together. The parents watched a slew of holiday-themed “shows” the four girls had made up expressly for this captive audience. We ate many meals together, at each other’s homes and at local restaurants – including a memorable dinner at a Mexican spot where Jones dad Rick quickly gathered up all the beverages and chips while his firecracker youngest daughter Bonnie popped a jalapeno into her mouth for the first time. Gail stifled a laugh and rolled her eyes. Not an uncommon reaction when it came to certain family antics. It feels impossible that the Jones family is down a member. She was my dance teacher for so many years, so many classes, at two studios – the Dance Center in Sacramento and Sue Geller Dance Studio in Fair Oaks. Early on, I adored her musical theater classes, “You’ve Gotta Have Heart” from Damn Yankees!, “Kids” from Bye Bye Birdie and “Everything’s Coming Up Roses” from Gypsy were a few of my favorite numbers – I still remember some of the steps – and Gail seemed to love them, too. Her love for things was more quiet, more reserved, so when you knew she was pleased, it made your heart sing – and stuck with you. (I think it’s precisely because she didn’t dole out compliments easily, cheaply.) In addition to many local dancers’ participation in the Sacramento Ballet’s annual production of The Nutcracker, our studio also did a miniature version of the holiday show each year. Once we were in high school, us older girls convivially vied for the role of Sugar Plum Fairy, hoping upon hope that this would be the year we’d be the one to perform to the tinkly, iconic music. We also loved doing the dance of the four swans from Swan Lake – another piece she seemed to favor – four 16-year-old girls in pointe shoes and ballet pink tights, arms crossed in front of each other’s bellies, dancing in tight formation and laughing and tiring out, all while trying not to kick each other. It was joyful and fun amidst the more disciplined dynamic of ballet class – we loved it and Gail did too. When I was a young teen, she explained the concept of adrenaline to me on one nighttime ride home from the dance studio. In addition to being a close family friend, she was a teacher I both admired and felt nervous around. She could be hard to get a read on and was someone you always wanted to impress. I wanted to connect and wasn’t quite sure of how. But we’d just finished a great series of classes, probably tap followed by jazz or ballet and some pointe work, and I felt full of energy and happiness, high from the evening. I told her so. She explained that that was dance. “It’s adrenaline. Your body gets moving and there’s music playing and you’re having fun. It produces adrenaline, gives you more energy – and makes you happy. It’s one of the many great things about dance.” Minor enlightenment during carpool. And connection – two dancers reveling in what is special about the art. I’ll never forget that moment. In recent years, Gail seemed to define what it meant to live life to its fullest. Her love of travel was evident – she even visited the Azores to see her family’s homeland. Wendy followed in her footsteps and became a respected dance teacher; I think Gail attended every performance. She loved the San Francisco Giants and relished her visits to the games. She spent lots of time with Bonnie and Joshua – always entertained by and proud of their latest endeavors. She read voraciously, even leading a book club to share this love with friends. She regularly attended the ballet and musical theater – and always loved a good party. Four years ago, she wrote me a touching note of condolence after the passing of my close friend, and two years later was one of the first to enthusiastically congratulate me on the publishing of my first book, commenting on its “true voice.” She always joked about her limited cooking skills and even said of the book, “I’m not sure how much I’ll actually cook from it, but am thoroughly enjoying reading it!” Just a year ago, she and her daughters gave my own her first pair of ballet slippers, before she was born. Gail was extremely active on Facebook, from what I can tell, with friends old and new, young and old, students and teachers, fellow artists, family members. With people from all stages of her life. Through the medium, she processed her bout with serious illness – and brush with death – a decade ago and her ongoing struggles with health. She reconnected with old friends; shared uplifting bits of poetry and dance news, motivational moments; posted updates from her vacations and enthusiasm for the ballet and Broadway – she was an avid user of social media and had an ability to motivate through her always authentic, never saccharine messages. She’d become a source of strength for others undergoing tough times. A recent post shared her experience taking a dance class for the first time in years, and how while physically tough and comical in its toughness, it connected with her dancer spirit and made her very happy. Probably gave her that famous rush of adrenaline. Now, her page and the pages of her family members have been lit up with condolence messages, tributes poetic and simple and all heartfelt, various forms of recognition of her passing. She will never read these messages, not in the way she used to anyway, but they are there, continuing to pour in as the hours pass. Death is for everyone and for no one. It’s the one thing we all must experience but without any real sense of how to take it on or what it’ll be like. It is awful to experience that of a loved one, the mystery, the finality, the not-yet-ness, just-one-more-day-ness of it all. “Death is a blessing for the dying – it’s the living who have trouble with it.” A dear friend said this to me last week. I’ve never heard it said like that but it, in this moment, feels as though it might be true. I’ve asked myself why Gail’s death feels so monumental. Not only was she a person who played an important role in my life, in my childhood, in my appreciation for dance and theater, but she represents a generation to which I’m nowhere near ready to say goodbye: my parents’. It’s a loss that signifies the inevitable cycle of life, a loss from the circle of close family friends I grew up knowing, a loss from what I grew up feeling was a protected class of individuals. A loss over whom my heart breaks for everyone who knew and loved her – and chiefly, for her husband of more than 40 years and her two beautiful, kind and full-of-life daughters of whom she was bursting with quiet pride. Gail said goodbye to life on the island of Maui after complications from thrombosis of the portal vein. She’d been very sick a decade before, even dancing with death through a coma, but fought back. This time, her body was too tired for the dance. It had sustained so much over the years and always pushed through to a semblance of health again. This time, it couldn’t muster quite enough strength. Even with all the support in the world from family at her hospital bedside and loved ones doing virtual dances across the oceans in her honor, her body had to give in. It did so at the end of a family vacation, after cocktails and fabulous restaurant meals and leis and many laughs. Even amidst the absolutely wrongness of losing such a good person, a cheerleader for life, way too soon – she was only 62 – it seems fortunate that she was able to take that important vacation and celebrate life with her whole family one last, big time. I honor her now by reading Angelina Ballerina to my toddler and remembering all the songs I first heard because of her. By admiring pink flowers and appreciating time with family and friends. By laughing wholly and not being afraid to experience life. And of course, by writing. I hope this essay honors her in its small way. The flood of memories, a lifetime’s worth, is hard contain and streamline, and so much is left off the page. But I can only think Gail would’ve enjoyed reading about her impact on others and the many ways she’ll continue to dance on in our hearts. Miles and miles and miles of heart. Gail gave me this recipe as part of a collective cookbook from the women who threw my wedding shower four years ago. What is most special is simply that it’s a recipe from Gail, the woman who didn’t really cook. It’s written in her distinctive, lilting script. Mix crumbs with grated cheese, parsley, garlic, salt and pepper. Dip chicken into melted butter, then into crumb mixture. Arrange in shallow pan. Dot with 2 T. of butter. Bake at 350 degrees – 1 hour or fork tender. Laura, you have captured the moment perfectly…I now have a better appreciation of Gayle because you illuminated her. Thank you for sharing during this difficult time. Remember to breathe and hug your family often. While Gail grew up carpooling with my mother and aunt in grade school, I was fortunate enough to know her as my dance teacher in grade school. Gail will always be a highlight of my childhood and upbringing. While dancing with she and the girls at The Dance Studio, I’ll never forget learning the basics of dance from the shuffle step to shuffle off the buffalo from Gail. Her persistence to help each kid understand the form and function of all styles of dance really made being a student of hers unforgettable. From “Everything’s Coming Up Roses” to “Oklahoma”, I will also never forget parts of each routine. Her spirit and will to live life to its fullest was very evident in the way she raised two beautiful girls. I know they too will carry on her spirit and give back to others what she did for us. Thank you Gail for being such a positive influence in my and my families lives. R.I.P. A lovely remembrance. It’s amazing how what seems to be many fleeting moments make up such meaningful connections. All the musical and dance memories (more music for me ; p) are coming back from back when. Thank you for sharing! Much love to you, your family, and the Joneses. It’s been too long.